← DRIES VAN NOTEN: INSPIRATIONS…and on the challenges of a fashion exhibition. Is the US FINALLY Going to Ban Cosmetic Animal Testing? The Humane Cosmetics Act, federal legislation currently before the United States Congress, would prohibit animal testing on any cosmetics sold or manufactured in the United States. Endorsed by the Humane Society of the United States (HSUS), Humane Society Legislative Fund (HSLF) and Humane Society International (HSI), the passage of House Resolution (H.R.) 4148 would make the US the next cruelty free zone alongside the EU, Norway, Israel, UK, India and San Paolo. Since it’s introduction, 22 other House Members have signed on as co-sponsors of H.R. 4148, including Rep. Michael Grimm, a Republican from NY giving the bill bi-partisan support. Several States have instituted bans on animal testing, but a federal law is necessary since state laws only apply within the boundaries of that state and can easily be circumvented by moving testing to a state where no such restrictions exists. Cruelty free companies such as Lush Cosmetics and Aubrey Organics have proven that humane products exist and are just as effective as those brands that do test on animals. Noted cruelty free brand, Urban Decay did an about face on its decision to sell in China after it received wide ranging backlash. China is one of the countries that requires products to be tested on animals before they can enter the market there. According to a poll conducted by Lake Research and commissioned by the HSUS and HSLF, there is widespread support for a measure such as this. The nationwide survey revealed that approximately three-fourths of American voters would be in favor of federal legislation that phased out animal testing for cosmetic products and ingredients. The majority of voters (55 percent) said they would favor this legislation strongly. Three in four voters said they would feel safer, or as safe, if non-animal methods were used to test the safety of a cosmetic instead of animal testing. 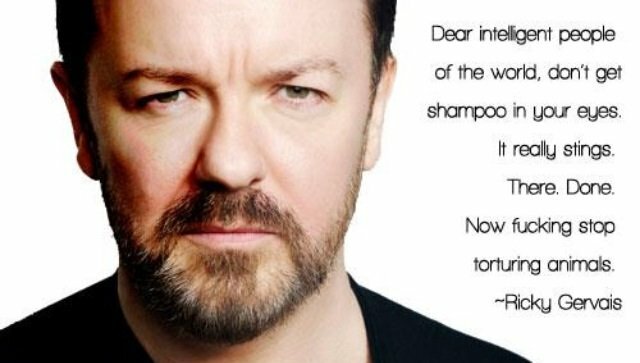 British comedian and animal rights activist, Ricky Gervais, urges Americans to support this legislation. Interested consumers can take action by contacting their representatives and urging them to support the Humane Cosmetics Act by becoming a co-sponsor. You can read the full text of H.R. 4148 here.